A mix of clouds and sun. A stray shower or thunderstorm is possible. High 66F. Winds S at 10 to 15 mph..
Cloudy with occasional rain showers. Low 46F. Winds SSW at 5 to 10 mph. Chance of rain 40%. Pennsylvania Lt. Governor John Fetterman held his 37th community discussion on the legalization of recreational marijuana at The Foundry in Reynoldsville on Saturday as part of his listening tour on the issue. Fetterman said it is his job to listen to what his constituents have to say on the issue and encouraged participants to freely speak their views. Pennsylvania Lt. 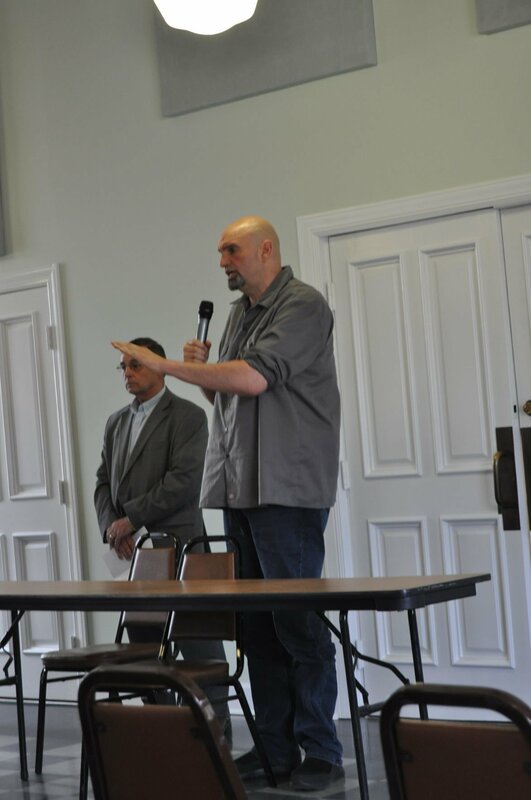 Governor John Fetterman held his 37th community discussion on the legalization of recreational marijuana at The Foundry in Reynoldsville on Saturday as part of his listening tour on the issue. Fetterman said it is his job to listen to what his constituents have to say on the issue and encouraged participants to freely speak their views. Pictured here is Fetterman interacting with members of the audience after the event. Fetterman thanked residents for taking time out of their day to participate in the event to share their views. “It’s my job to be here and find out exactly where the people of Jefferson County’s views are on this incredibly important issue. It’s not your job, though. You could be out cutting the lawn or watching Netflix. You chose to come here and talk about this issue. I am grateful for that,” Fetterman said. Fetterman said this was the 37th county stop and at every stop civility had been readily given. He stressed that the event was a secure environment to share opposing views on the issue. “There is no right or wrong answer. This is a true listening tour,” Fetterman said. Jefferson County Commissioner Herb Bullers Jr. said he was at the event to listen to what the residents of Jefferson County had to say on the issue. He said he would take the views of the people back to the Jefferson County Commissioners for discussion and asked the residents to carefully weigh the pros and cons of the issue. “We want to hear from as many of you as possible,” Bullers said. Fetterman gave state Rep. Cris Dush (R-Brookville) an opportunity to make a statement before turning the floor over to the residents. Dush said he wanted to make the distinction that the discussion is on recreational use of marijuana rather than its medicinal use. He said based on his experience in the Department of Corrections individuals are not incarcerated solely for marijuana usage. “There is always something else that is attached to that. I have read the pre-sentence investigation on thousands of inmates and was very aware on why they were locked up. There are things we can do within the court systems such as community service and treatment that can be beneficial. That also is not part of this. This is about going ‘full blown Colorado’ recreational use, as the term was used. I am looking forward hearing from you on this issue,” Dush said. Jefferson County residents expressed diverse views on the issue. Fetterman asked speakers limit their comments to approximately 90 seconds. A resident of Brookville named Joyce said her experience as a chemistry professor has led her to strongly support the legalization of recreational marijuana. She said many individuals who suffer from opioid addictions turned to opioids as a source of pain relief. She said the science on whether the legalization of recreational would help the opioid crisis is unclear but felt it would do more help than harm. “I can’t see that it can hurt at this point. Our crisis is so bad, we need to do something. My personal feeling is that I am strongly in favor of legalization,” Joyce said. A Brookville resident named Tonya said her time in the department of corrections led her to be strongly opposed to legalization as she felt it was a gateway drug to stronger substances and said she has seen marijuana ruin lives. She said parents are using marijuana and giving the opportunity for their children to use it, both accidentally and deliberately. “After over 20 years in corrections and interviewing thousands of inmates, every one of them that started in drugs started in marijuana. Just because we legalized alcohol doesn’t mean we should legalize something else. I am very much not in favor of it. I have seen lives ruined. I have had foster kids whose lives have been turned upside down. I have adopted a child who has no mother and father because of drugs and alcohol. We need none of that,” she said. A medical marijuana patient named Becky said she was in favor of legalization as she claimed marijuana saved her life and believes all marijuana use is medicinal. “It saved my life literally. It got me off almost half of my medications and gave the first normal pulmonary function test in years. I am very in favor of legalization as all use is medicinal use, whether a user realizes it or not,” Becky said. An individual named Diana said her two nieces both died prematurely because of marijuana use. She said one of her nieces began to use “angel dust” (PCP) because of her marijuana use. She said the “angel dust” severely affected her niece’s brain and when she stopped using the prescription her doctor gave her, her niece took her own life. She said her other niece became addicted to marijuana and alcohol and lost custody of both of her children. An individual from Brookville named Joe said while he is for legalization, it would not be an easy problem to fix. He said Pennsylvania should learn from other states that have legalized marijuana. “I am for it. I don’t want other people to tell me what I can’t have. I think we need to do it in a safe way and I don’t think anyone in this room can disagree with that,” Joe said. An individual named Milton said he was strongly opposed to legalization after spending six years with the Clearfield and Jefferson County Drug and Alcohol Commission. He said he had a family member who has been incarcerated both in Jefferson County and Pittsburgh for drug related charges and who graduated from marijuana use to opioids. He said he spent time in Canada and had seen hospitalizations and homelessness increase. After the public discussion, Fetterman spoke to the press about the listening tour. “The critical juncture now is what your views are and that is what we are here to find out,” Fetterman said. He said a tabulation of constituent views gained from the tour and other sources is already being formed and transparency is the goal of the final report. “People are weighing in online, submitting comment cards and they are speaking. I am reading comment cards from individuals and I am considering everything. The final report will be distributed to the governor and statewide. Everyone will know what Jefferson County thought back in April,” Fetterman said. Fetterman said the meeting in Jefferson County was unique among those held in the other 37 counties in that most of the audience was opposed to legalization of recreational marijuana. A mix of clouds and sun. A stray shower or thunderstorm is possible. High 66F. Winds S at 10 to 15 mph. Cloudy with showers. High 57F. Winds light and variable. Chance of rain 40%.